Oh, we'd hate to be a RIM BlackBerry 8800 owner right now. Just months after the 8800's release, Research in Motion has released a sleeker and sexier model that'll make you wish that you had waited a while longer--the world of technology can be so cruel. The RIM BlackBerry Curve (aka BlackBerry 8300) is the smallest and lightest full-QWERTY BlackBerry to date, and we're absolutely stoked on the design. It feels more like a cell phone with the compact dimensions, yet you still get the advantage of a full keyboard for easy messaging. We want to be clear that the BlackBerry 8300 is more about the revamped design, rather than new features. The device does offer a few improvements, such as a spell-checker for e-mail and an upgraded 2-megapixel camera, but it still lacks the big items on a our wish list, namely Wi-Fi and 3G support. And to be fair, the BlackBerry 8800 may still be a better fit for power business users with its GPS functionality and lack of a camera (an increasing security concern at workplaces). That said, for consumers and mobile professionals, the BlackBerry Curve is a beautifully designed and well-rounded device that delivers great e-mail functionality, a little multimedia fun, and solid performance. 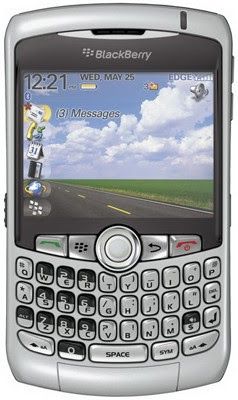 The RIM BlackBerry Curve is available now through Cingular/AT&T for $199.99 with a two-year contract and after mail-in rebates. The carrier said it plans to launch the BlackBerry 8300 later this spring, and we will, of course, keep you updated as get more information. Hopefully you won't have to wait too long. Simply put, it was love at first sight. Though we don't fully understand the name--it's no curvier than the BlackBerry Pearl or any of the other latest BlackBerrys--the RIM BlackBerry Curve offers a best-of-breed design that beautifully combines a full QWERTY keyboard into a sleek and compact form factor. The silver-and-black color scheme is standard but attractive nonetheless. We'll admit there's a slight resemblance to the Palm Treo 680 from the front, but it's much thinner and more manageable in terms of size. In fact, it's the smallest and lightest full QWERTY BlackBerry to date at just 4.2x2.4x0.6 inches and 3.9 ounces. By comparison, the BlackBerry 8800 measures 4.4x2.6x0.5 inches and 4.7 ounces, while the Treo 680 measures 4.4x2.3x0.8 inches and 5.5 ounces. With such a slim profile and small weight, the Curve is comfortable to hold and use as a phone, even though it has a wider body than regular cell phones. The outer edges also have a soft-touch finish to give it a rubbery texture, thus making it easier to grip. In general, the device has a solid construction, but we did notice the slightest separation between the front faceplate and the phone's body on the left side. However, we're not concerned that this is something that will cause the phone to break. On front of the device, there's a 2.5-inch diagonal, 65,000-color screen with a 320x240 pixel resolution. The display features a light-sensing technology that automatically adjusts the backlighting of the screen as well as the keyboard, based on your environment (indoors, outdoors, a dark room, and so forth). In addition, you can customize the screen with various themes and wallpaper, as well as adjust the font size, family, and style. We didn't have any problems reading the contents of the screen under various lighting conditions, and both text and images were sharp and vibrant. As with all BlackBerry models, the Curve does not have a touch screen, but we still found the device easy to use and navigate with the provided controls. You'll find these controls beneath the screen; they include the Talk and End/power buttons, a Menu shortcut, an Escape key, and the trackball navigator. You can adjust the sensitivity of the latter under the Settings > Screen/Keyboard menu. Along the right side, there is a volume rocker and a user-defined launch button that's set to activate the camera by default. The left side holds a mini-USB port as well as another programmable convenience key, and--good news--the BlackBerry 8300 is equipped with a 3.5mm headset jack, so you can plug in Walkman-style headphones. One of the biggest complaints about the BlackBerry 8800 was its keyboard. RIM switched up the layout and feel of the keyboard on the 8800, and many users found the buttons to be slippery and cramped. Happily, the BlackBerry Curve's full QWERTY keyboard offers a better typing experience, as it reverts back to the styling of the keys found on the BlackBerry 8700g and 8700c. This means you get more spacing between the buttons, and they're tactile and less slick. Finally, the camera lens, flash, and self-portrait mirror are on the back of the device, and a mute button is located on top. The 8300 is equipped with a microSD slot, but it's inconveniently located behind the battery. The RIM BlackBerry Curve ships with a travel charger, a USB cable, a wired stereo headset, a belt holster, and reference material. For more BlackBerry add-ons and downloads, check out our cell phone accessories page. The RIM BlackBerry Curve doesn't offer anything revolutionary in the features department (read: no Wi-Fi or 3G support), but as mentioned previously, there are some slight enhancements. First, the Curve adds a new spell-check functionality for e-mails. As you would expect, the feature will look for any spelling errors in your messages before they're sent and offer alternatives to misspelled words. Spell-check is also available for memos, but not for text messages. You can turn this feature on under the Options > Spell Check menu, where you can also find settings to ignore acronyms, words with numbers, add words to a custom dictionary, and more. During our review period, the feature worked great, and it definitely comes in handy--especially if you're sending messages to clients, your boss, and other professionals. The BlackBerry Curve is compatible with your company's BlackBerry Enterprise server with support for Microsoft Exchange, IBM Lotus Domino, or Novell GroupWise to deliver corporate e-mail in real time. In total, the device can support as many as 10 accounts, including POP3 or IMAP4 e-mail accounts, and there is an e-mail wizard on the device to guide you through the setup process. An attachment viewer is also onboard to open popular file formats, such as Microsoft Word, Excel, PowerPoint, Corel WordPerfect, PDFs, JPEG, GIF, and more, and we were able to receive and open all files. Other messaging options include text, multimedia, and instant messaging, although the latter is limited to the proprietary BlackBerry Messenger client. As for voice features, the Curve is a quad-band world phone and offers a speakerphone, voice-activated dialing, smart dialing, conference calling, speed dial, and support AT&T/Cingular's push-to-talk service. In addition, the phone features advanced audio technology that's supposed to cancel out background noise and echoes and will automatically increase the volume when you're in a noisy environment. (See the Performance section below for more on call quality). The BlackBerry 8300's phone book is limited only by the available memory--the SIM card holds an additional 250 contacts--with room in each entry for eight phone numbers, e-mail addresses, work and home addresses, job title, and more. For caller ID purposes, you can assign a photo to a contact as well a group category--business or personal--or one of 45 polyphonic ring tones. The Curve also supports MP3 and MIDI ring tones. Once again, wireless options on this BlackBerry are pretty disappointing. There's no integrated Wi-Fi nor is there 3G support. You're reduced to surfing the Web at EDGE speeds, which, yes, aren't that slow but also aren't very fast. Also, unlike the BlackBerry 8800, the Curve doesn't include a GPS radio. Instead, you will have take advantage of the device's integrated Bluetooth and add this functionality via a Bluetooth GPS receiver. Other supported profiles include wireless headsets, hands-free kits, dial-up networking, object exchange, and A2DP for stereo Bluetooth headsets. One-upping the BlackBerry Pearl, the Curve boasts a 2-megapixel camera (vs. 1.3 megapixels) with a 5x zoom and a built-in flash, but unfortunately, still no video-recording capabilities. You do get three picture sizes (1,600x1,200; 1,024x768; and 640x480) and three quality options (superfine, fine, and normal). You can also tweak the white balance and add color effects. That said, we were pretty disappointed by the quality of the pictures. Though the images had sharp definition, the colors were off and had a gray overtone. For more entertainment, there's also a media player onboard that supports MP3, AAC, MIDI, and WAV music files and AVI, MP4, MOV, and 3GP video formats. There's 64MB of flash memory, but you should store multimedia files on a microSD card since they tend to be memory hogs. The music player is pretty rudimentary, but it displays some track information such as title, artist, and album art, and you can create playlists as well as shuffle and repeat songs. You can have music play in the background while you use the device's other apps, and if there's an incoming call, the Curve will pause the music, then resume the track after you hang up. One notable improvement to the video player is the support for full-screen mode, so you can take advantage of the entire screen's real estate. The 3.5mm headset jack is also a boost, since it gives you the ability to plug in a better set of headphones or earbuds. Finally, the BlackBerry Curve includes a number of PIM tools, such as a calendar, a tasks list, a memo pad, an alarm, a calculator, and the BlackBerry maps application. The latter is particularly useful, as it gives you maps of the United States as well as text-based driving directions--great for mobile professionals. Of course, you can always download more applications; check out Download.com for some ideas. We tested the quad-band (GSM 850/900/1800/1900; EDGE) RIM BlackBerry Curve in San Francisco using Cingular service, and call quality was just OK. We had no problems hearing our callers, but there was a slight hollowness to the overall sound. In addition, our friends reported an echo on their end. As we mentioned earlier, the 8300 features an audio technology that's supposed to block background noise and echoes, but we didn't really find that to be the case. We did notice, however, that the call volume automatically increased when we were talking in noisy surroundings, such as a busy street corner. It's a bit alarming at first, since you're not expecting it, but it does help to hear your callers. Speakerphone quality was good, and we were able to connect to the BlackBerry with the Logitech Mobile Traveller Bluetooth headset. General performance was snappy. Despite the occasional "loading" message when trying to view photos in slide show mode, we didn't run into too many delays when opening or working in various apps. Music playback through the device's speakers was impressive for a cell phone, with fairly full sound and decent balance, but we could have done with a little more bass. Watching video was smooth overall. Audio and video were synchronized, but as expected, there was some pixelation of the picture during action sequences. Web-browsing definitely could have used a boost from 3G speeds, as we got a little impatient waiting for pages to load. The BlackBerry Curve is rated for 4 hours of talk time and as long as 17 days of standby time. In our battery tests, we were able to get 8.5 hours of talk time on a single charge. According to FCC radiation tests, the BlackBerry 8300 has a digital SAR rating of 1.51 watts per kilogram.